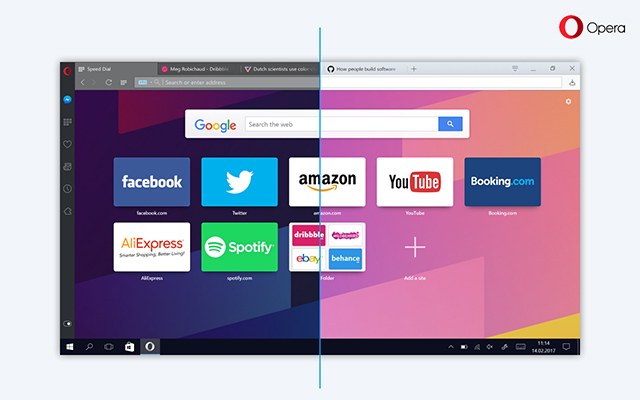 Opera just released a new build of its desktop browser in the developer stream. And this is an interesting one as the company just unveiled a brand new project codenamed “Reborn” — it’s a complete user interface redesign for all platforms. I’ve been using Opera as my main browser for a few years now. I just tried the new version, and it seems to be a visual update more than anything. Things look different but work the same way behind the scene. The buttons and tabs have a new design. They’ll look the same on all platforms. I’m not sure I’m a fan of this change as the new tabs look like Windows 10 tabs, even on macOS. It doesn’t feel native. Speed dial was slightly redesigned with more prominent shadows and subtle animations. It’s an improvement. There will also be new default wallpapers for the speed dial. If you’re like me and are using the dark version of macOS, you’ll be happy to learn that there’s a new dark theme for the user interface. It changes all the buttons and address bar to black and dark grey. Finally, the most interesting change is the sidebar. Somehow, Opera loves sidebars. There have always been sidebars of some sort across all Opera versions. This time, the company is borrowing from its experimental browser Opera Neon. You can activate the sidebar and it stays visible all the time. You’ll find the usual shortcuts, such as bookmarks, history and speed dial. But you’re also able to open a tiny version of Messenger.com. I’m sure this is an example and there will be more extensions, but it’s an elegant way of checking your messages, writing a few messages and going back to your browsing. If you need to write longer messages, you can open a permanent side panel with Messenger, splitting the screen between your browser and Messenger. The current version of Opera already has sidebar extensions, but I’m not sure many people are using them right now. They will be more prominent and useful with this design. Opera first releases new features in the developer stream, meaning that it’s still unstable and in beta state. But after a couple of months, changes make their way to the consumer version of Opera. So you can expect to see the full redesign in a couple of months.